Overall, 39% say they approve of how Trump is handling his job as president, while 56% say they disapprove and 6% do not offer a view. Job ratings for Trump are more negative than for other recent presidents at similar points in their first terms. By margins of more than two-to-one, larger shares of the public approved than disapproved of the early performance of Ronald Reagan, George H.W. Bush, Bill Clinton, George W. Bush and Barack Obama. For example, in February 2001 – just a few months after Bush defeated Al Gore, despite narrowly losing the popular vote – 53% approved of how he was handling his job, compared with just 21% who said they disapproved. An overwhelming share of the public (94%) offers a job rating for Trump; just 6% say they don’t know whether they approve or disapprove of him. By contrast, about two-in-ten or more declined to offer an early view of prior presidents dating back to Reagan in 1981. 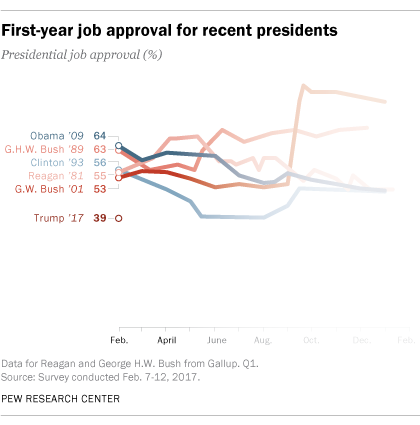 The approval ratings of Trump’s recent predecessors followed different trajectories over the course of their first years, with a few improving in the eyes of the public, while others saw their ratings decline. Clinton began his first term with an approval rating of 56%, but his ratings fell to around 40% by the summer of his first year, before recovering somewhat by the end of 1993. Obama saw a gradual decline in his initially high approval ratings over his first year. By contrast, ratings for George H.W. Bush rose over the course of 1989. Ratings for Reagan initially moved higher, but then declined later in the year. Approval ratings for George W. Bush were around 50% through the summer of his first year, but shot up to the mid-80s following the Sept. 11, 2001 terrorist attacks. Among Republicans and Republican-leaning independents, 84% say they approve of the job Trump is doing. This is in line with early levels of support seen among members of the president’s own party in recent administrations. However, just 8% of Democrats and Democratic-leaning independents say they approve of the job Trump is doing. This is by far the lowest early approval rating among members of the party not in control of the White House over the last six administrations. 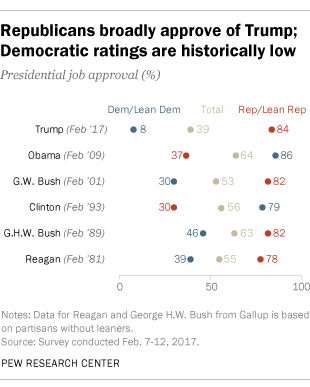 Early presidential approval among out-party members has been no lower than 30% in prior administrations dating to Reagan. In addition to a wide majority of the public being able to rate Trump’s early job performance, most say they approve or disapprove of him strongly. Overall, 46% say they disapprove of Trump strongly, while another 9% say they disapprove but not strongly. And by about three-to-one, more of those who approve of his performance say they feel this way strongly (29% of total public) than not strongly (8% of total public). Intense disapproval of Trump is a majority view among several demographic groups. Most blacks (63%), Hispanics (56%), postgraduates (61%), college graduates (54%), women (54%) and young adults ages 18-29 (55%) say they strongly disapprove of Trump’s job performance. Trump’s ratings are less negative among whites (49% approve, 46% disapprove), men (45% approve, 48% disapprove) and those ages 65 and older (48% approve, 47% disapprove). Nonetheless, strong approval is no higher than strong disapproval among all of these groups. Whites without a college degree are one major demographic group for which most approve of Trump’s job performance (56%) and strong approval outweighs strong disapproval (46% vs. 32%). 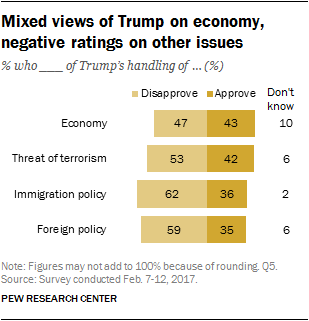 When it comes to specific issues, Trump receives negative ratings for his handling of terrorism, immigration and foreign policy; his ratings on the economy are more evenly split. Overall, 43% approve of the way Trump is handling the economy, while 47% say they disapprove and 10% do not offer a view. More disapprove (53%) than approve (42%) of how he is handling the threat of terrorism. About six-in-ten say they disapprove of how Trump is handling the nation’s immigration policy (62%) and foreign policy (59%). Most Americans see Trump as someone who keeps his promises and is able to get things done, but the public holds negative views across many other characteristics, including his trustworthiness and temperament. Fully 60% describe Trump as someone who keeps his promises, while just 31% think of him as someone who doesn’t keep his promises. Most also view Trump as able to get things done (54%); 40% do not think of him this way. As many say Trump is a strong leader as say they don’t view him this way (49% each). When it comes to his management ability, 45% think he is a good manager, while 52% say this phrase does not describe him. Trump’s image is much more negative across a range of other characteristics. Majorities say that Trump is not even tempered (68%), is not a good communicator (63%), is not trustworthy (59%), is not well-informed (57%) and does not care about “people like me” (56%). 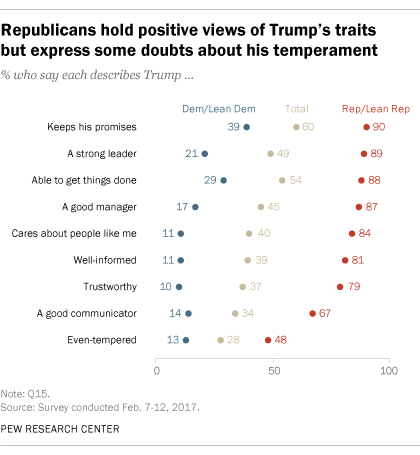 Across most traits, large majorities of Republicans and Republican leaners ascribe positive characteristics to Trump, while relatively few Democrats and Democratic leaners do the same. For example, 81% of Republicans say Trump is well-informed compared with just 11% of Democrats. However, the partisan gap is slightly narrower on whether Trump keeps his promises, with 39% of Democrats saying he does so. And among Republicans, about as many say they think of Trump as even tempered (48%) as say they do not think of him this way (47%). This is by far the item Trump performs the worst on among Republicans. About half of the public (52%) says Trump makes them feel uneasy; 46% say he does not make them feel this way. Anger is a less-commonly held negative emotion: 39% say Trump makes them feel this way, compared with 59% who say he does not. A pair of positive reactions to Trump does not register widely: 40% of the public says Trump makes them feel hopeful (59% say he does not), while 33% say he makes them feel proud (65% say he does not). 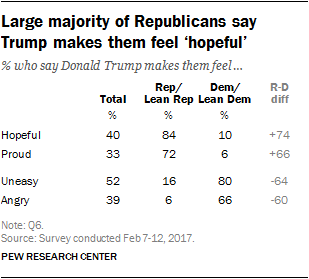 Overall, 84% of Republicans say Trump makes them feel hopeful and 72% say he makes them feel proud. Few Republicans say Trump makes them feel uneasy (16%) or angry (6%). Among Democrats, more say Trump makes them feel uneasy (80%) than angry (66%). 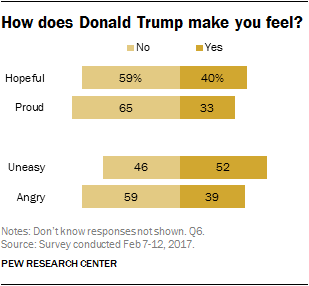 Just 10% of Democrats say Trump makes them feel hopeful and only 6% say he makes them feel proud. At the outset of his administration, the public is not confident that Trump keeps his business interests separate from the decisions he makes as president. Four-in-ten say they are either very (24%) or somewhat (16%) confident that Trump keeps his business interests separate from the decisions he makes as president. Nearly six-in-ten (59%) say they are either not too (15%) or not at all (43%) confident that he is doing this. Among Democrats, 69% say they are not at all confident that he keeps his business interests separate from his job as president (another 18% say they are not too confident). Among Republicans, 53% say they are very confident and 29% say they are somewhat confident that he is keeping them separate. How much respect does Trump have for democratic institutions? Most Americans say Trump does not have much respect for the country’s democratic institutions. Overall, 59% say Trump has not too much (25%) or no respect at all (34%) for the country’s democratic institutions and traditions. A smaller share (40%) says he has either a great deal (18%) or a fair amount (22%) of respect for these institutions. Views on this question are little changed from October 2016, during the general election campaign. As with virtually all assessments of Trump, there are wide party divides in views on this question. Among Republicans and Republican leaners, 77% say Trump has either a great deal (42%) or a fair amount (34%) of respect for the nation’s democratic institutions. 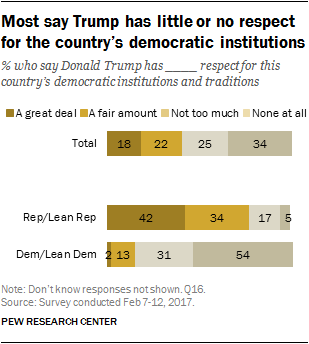 By contrast, 85% of Democrats and Democratic leaners say Trump has little respect for democratic institutions and traditions in the U.S, including a majority (54%) of Democrats who say he has no respect at all for these institutions and traditions. Overall, more hold an unfavorable (57%) than favorable (41%) view of Trump. Views among demographic groups largely mirror patterns in presidential job approval. For example, most blacks (80%), Hispanics (72%), adults ages 18-29 (71%) and ages 30-49 (61%), and women (64%) hold an unfavorable view of Trump. Views among postgraduates (68% unfavorable) and college graduates (62% unfavorable) also are broadly negative. Trump’s favorability ratings are more positive among whites (51% favorable vs. 48% unfavorable) and men (48% favorable vs. 49% unfavorable). Those ages 50-64 and ages 65 and older also are about as likely to view Trump favorably as unfavorably. Among whites without a college degree, a 57% majority holds a favorable view of Trump. Views of the national economy are the most positive they have been since prior to the Great Recession. The more positive assessments of the economy are the result of improved views among Republicans in the wake of the 2016 election, and steady economic ratings among Democrats. Overall, 42% rate economic conditions as excellent or good, while 39% say they are only fair and just 18% describe them as poor. This marks the first time in a decade that about as many say the economy is excellent or good as say it is only fair. The share rating the economy as excellent or good is up 11 points since December. Looking ahead, 38% expect economic conditions to be better in a year, while nearly as many (32%) think they will be worse; 28% expect them to be about the same as they are now. Far more now expect economic conditions to change over the next year (either for better or worse) than said this prior to the election, as views among Republicans have grown more optimistic and views among Democrats have become more pessimistic. Since December, the share of Republicans who rate economic conditions as excellent or good has shot up from 18% to 40%. Looking forward, 75% of Republicans expect conditions to be better in a year; in June, just 27% said this. Overall, 46% of Democrats rate the economy as excellent or good, little changed over the last several months. However, Democrats’ economic outlook has changed significantly since the election. Just 14% expect economic conditions to be better in a year; nearly half (49%) think they will be worse, and 34% expect them to be about the same. In June, before Trump’s election win, most Democrats (58%) expected the economy to be about the same in a year and the share who thought it would be better (32%) outweighed the share who thought it would be worse (8%).